1 What is police laser (aka police lidar)? 2 Are police laser guns accurate? 3 Can police laser be used at night? 4 What’s the maximum targeting range of police laser? 5 Can police lidar guns take pictures for evidence against you? 6 Do laser detectors work? 7 How can you avoid laser speeding tickets? What is police laser (aka police lidar)? Before we discuss how you can protect yourself from police laser traffic enforcement, let’s first describe what it is. A police laser (i.e., police lidar) gun emits a highly focused beam of invisible infrared light in the near infrared region of light that is centered at a wavelength of 904nm and is only about 22 inches (56cm) in diameter at 1000 feet (300m). Are police laser guns accurate? 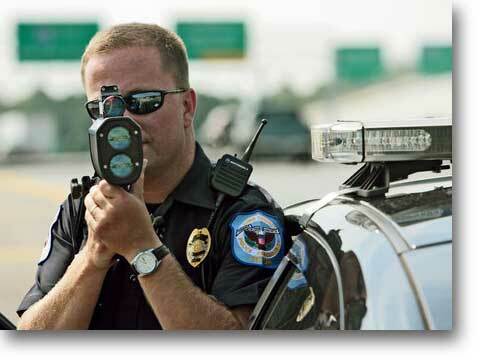 Police laser is very accurate and can often determine you speed to the 10th of miles per hour. Unlike police radar which directly determines a vehicle’s speed by measuring its doppler (speed induced frequency) shift, police lidar calculates speed by observing the changing amount of time is takes to “see” a series of reflected pulses of light over a discreet period of time. Today’s fifth generation police lasers provide superior construction quality with improved optics, circuitry, and speed detection algorithms that are far more advanced and are proving to be especially lethal to drivers on the roadways, including those who use laser jammers. Can police laser be used at night? Yes this form of traffic enforcement can be and is often used at night and speed measuring distances can increase significantly making it extremely hard to know that your speed is being clocked. Laser can be operated from very far distances, much farther than police radar, making it extremely difficult for the driver to know that they are being targeted. Unlike police radar, laser can be operated at such great distances, officers really don’t even have to hide like police radar operators, because it’s extremely hard to spot them from those extreme targeting distances. Some laser guns can successfully measure your speed as far away as 4000 feet or more, though generally targeting distances are below 2000 feet. A good laser detector can be very good at detecting laser, although without the protection that Veil provides, drivers typically have little time to react (see videos with and without Veil). Only the Valentine 1 radar detector has demonstrated that it can provide advanced warnings when other vehicles are being targeted ahead and around you. How can you avoid laser speeding tickets? So, now that we have defined the threat, let’s explore a simple way to protect you from being successfully targeted. Veil is a patented stealth technology which works by absorbing police lasers infrared light pulses (much the same way sunglasses absorb the visible sunlight). This makes it much harder on the guns to see their own reflected light pulses. The most reflective parts of an automobile or motorcycle are its headlights and license plates. By treating them with the Veil, the remaining and less reflective parts that are not treated won’t give the guns enough of a reflection that they require at a given distance to be able to obtain a speed reading. This buys the driver precious additional time to safely react and to slow down during an attempted speed measurement. Discover how Veil can help keep you ticket free.